Nails chip for a lot of reasons but it is reversible. Nutrition – Nails chip because of poor nutrition. If you are not eating enough protein or barely eating your nails will chip. Eat at least three meals a day or small meals throughout the day rich in minerals, vitamins and fiber. Eat beans, vegetables, fruits, and lean meats/fish. Drink plenty of water, you nails will reflect what you put into your body. Stress- If you are under severe stress, your nails will become brittle, break and chip. Try to seek help for stress such as yoga and looking at your problems from different prospectives, as well as therapy. When you destress your nails will begin to look better. Maintenance- A good way to stop nails from chipping is to get them done regularly. Bitting nails and not getting manicures will cause a break down in the nail. Nails are like anything- if you ignore them and do not take care of them they will be in poor condition. Stop biting your nails, and at least try to apply polish to nails once a week as well as file them. Illness – Sometimes your nails chip because you are sick. A lot of people do not even know they have a disease until they look at their nails. If you have yellow or other colored brittle chipped nails see a doctor. These type of nails are tale tell signs of a problem, and you should see a doctor if you are concerned. 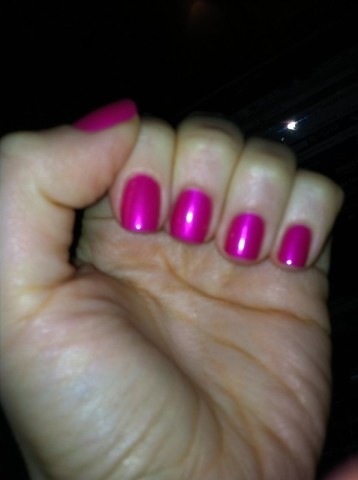 Bad Manicures- If your manicurist is simply bad at painting nails, or you are yourself your nails could chip. I’ve been to nail salons where the person did a bad job and my nails would chip almost immediately, and other times when it wouldnt ever . This will always depend on who is painting your nails and their abilities.